Misplace one or both of your AirPods? with this be rest assured to get it back with easy Starting with iOS 10.3, you can use the Find My iPhone app. Apple's wireless earbuds are tiny and have zero strings or cables attached to them, and while that's cool, they're always at risk of being lost. To help you find a lost AirPod, they're now a part of the Find My iPhone app. In order to use the new feature, you will need to update your iOS devices to iOS 10.3. It's currently in beta, with an official release expected in the coming months. You can sign up for the beta program here. AirPods can only be found when outside the charging case. They must be within Bluetooth range of an iOS device tied to your iCloud account in order for the current location and play sound features to work. with iOS 10.3 installed, open the Find My iPhone app. Your AirPods will show up under the list of devices linked to your iCloud account. Tap the AirPods listing to view their last known or current location. At the bottom of the screen is a button titled Play Sound. Tap Play Sound, and then wait while the app processes your request. A few seconds later, any AirPod outside of the charging case will begin playing a sound that gets progressively louder. You can then mute either AirPod, should you find one but need to continue looking for the other. Tap Stop Playing once you've found both devices. 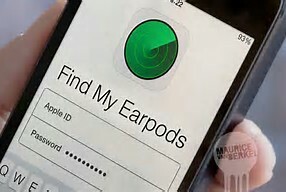 Visiting iCloud.com/find will also support finding lost AirPods, however as of this writing it doesn't seem to be live just yet.